The Sony a6300 is a very compact and very powerful consumer level ILC. Sporting the Sony E-mount system and powerful features, this camera has all the power and quality that you will find in a DSLR, packed into a compact frame. Read more in our Full Conclusion. Sony's new Alpha Series ILC --- the a6300 --- picks up where the a6000 left off in 2014, turning an already formidable camera into a DSLR destroyer at this thousand dollar price point. 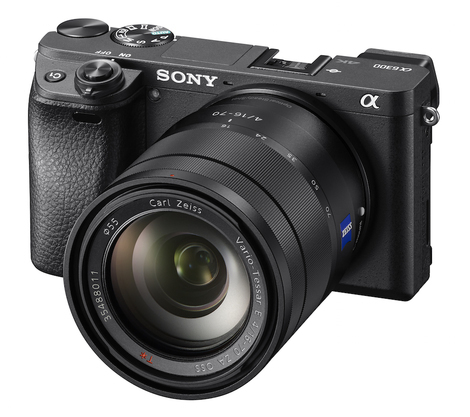 This Sony E-mount ILC system boasts a 24.2-megapixel Exmor CMOS image sensor coupled to the BIONZ X image processing engine for speed and enhanced ISO performance, but the two biggest features on this camera are its upgraded 4D FOCUS™ system and video recording capabilities. 4D FOCUS™ is a Fast Hybrid AF system that combines 425 phase detection AF points with contrast AF to lock onto static and moving subject in 0.05 seconds. Sony claims this is the world's fastest AutoFocus system. Whether or not that's true, overall speed promises to impress and we can't wait to test this feature out. With cinemas and home televisions uprezzing to 4K, so do ILCs and DSLRs. The Alpha 6300, though, aims to be more than a consumer-level camera, perhaps thanks to Sony's developments in making professional movie cameras. It records 4K videos in the Super 35mm format at up to 100 Mbps using the XAVC S codec. According to Sony, in 4K recording "the camera uses full pixel readout without pixel binning to collect 20 megapixels of information - approximately 2.4x5 (6K equivalent) as many pixels as 4K UHD and then oversamples the information to produce high quality footage with exceptional detail and depth." The Alpha 6300 also shoots Full 1080p HD video at up to 120FPS, perfect for capturing in-camera slow motion. Pros and budding filmmakers will also enjoy the built-in microphone input (which can be used with an optional XLR adapter), adjustable picture profile settings, support for 14-stop wide dynamic range (S-Log gamma recording) and wider color space (S-Gamut). Add in 11 FPS Continuous Shooting, an ISO sensitivity range of 100 - 51200, built-in WiFi & NFC, terrific ergonomics and customization options, and all of these things housed in a rugged, dust and moisture resistant magnesium alloy body and the Alpha 6300 looks to be one powerful and affordable camera. Sony has raised the bar, folks. The Sony Alpha 6300 ILC is available now in two forms. The first is a $999 MSRP body-only. The second is a $1,149 MSPR kit that includes a 16-50mm F3.5 - F5.6 Powered Zoom lens (model SELP1650).